So, yesterday was the final day of the seasonal sale at W Cosmetics. 20% off everything. Naturally I thought it was better to spend my money then than on another occasion where I’d get less for the same amount. Haul is a really stupid name for “Look what I bought!” but since it’s commonly used, I decided to go with it. I have no clue how clear the photo is, so let’s step it through. What did I get? Clio Art Shadow in 417 Forte Green Brown for 18.95. This is a trio of eyeshadows in a small compact (it’s the blue package with the face on it). Seems like a very convenient package for travel and has a gorgeous green shadow that could force me out of my beige comfort zone. Clio Moist Cusion Complexion Corrector in 01 Natural Beige for 32.95. That would be the beige package. So yeah, I like cushion foundations and I like Clio. It has SPF 50+ and PA+++, so that’s a massive plus. It’s also smaller than my other cushion and thus I hope it will be easier to bring it when I travel. Will probably review this at some stage. Holika Holika’s Pig-Nose Clear Black Head Mask Sheets for 3.50. It’s a 3-step treatment for blackheads, I’ve heard it’s good and thus decided to try it. No exciting backstory really. Sheet masks: Mediheal Cacao Ade Mask for 1.50. TonyMoly’s Broccoli & Makegeolli masks for 1.80 each. Have never tried any mediheal masks before, so why not go with one that probably smells good? 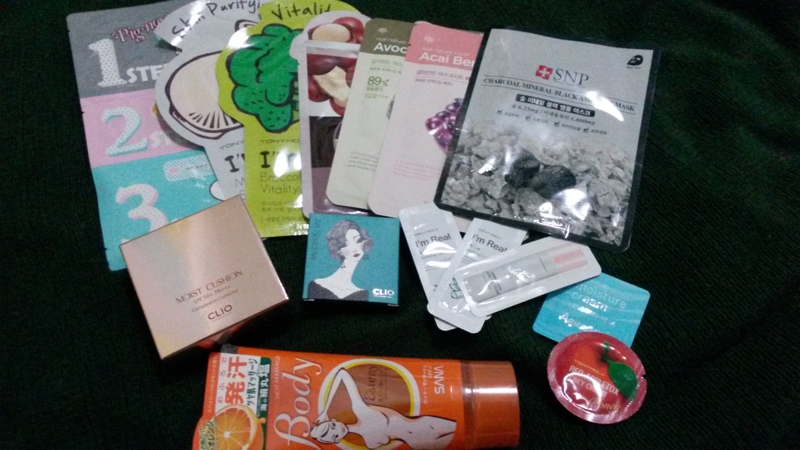 I like TonyMoly’s masks and so I decided to try two variations I haven’t tried before. Samples: a total of five. All of them TonyMoly. Four moisturising products (cashier thought my skin looked dry) and one CC cream. The other items in this photo? Picked up two face masks at an Asian grocery store, both from The Face Shop. Mainly because I wanted to compare prices but also because I haven’t seen the acai berries and avocado masks in a lot of other places. The SNP charcoal mask and the massage lotion were bought at MD Ranking. Have wanted to try charcoal masks for a while, so I grabbed one of those. The lotion is one of those heating lotions that’s meant to firm the skin. Don’t care about the firming part, but lotions that warm up is really nice in winter. Wish I’d found that one before I bought a heater.